I’m always on the hunt for good first chapter books for new readers, as I find them hard to find. They are often banal or too dumbed down. This “first chapter book” is a treat – it has good humor, as well as unusual elements such as maps and timetables for the reader to follow. It has a simple plot, with an attempt for the story to be a mystery to be solved, but the clues are present on every page. 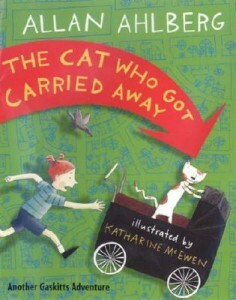 I like the format of The Cat Who Got Carried Away. The children’s book has a mixture of pages with short sentences as well as those with longer paragraphs. I particularly like the way some of the chapters begin with very few words on each line. For a new reader, sometimes all those words can be overwhelming. The book also makes use of repetition, which for a new reader, is very reassuring. For example, “and stretches and stretches and stretches up…” is both fun, and good practice. The illustrations are contemporary and whimsical. My overall sense about The Cat Who Got Carried Away is that it makes an easy transition from read-aloud by a parent, to independent reading. Even if you read every other line with your child, or let them read one line, and you read the next, this children’s book will be fun. Ahlberg has quite a few children’s books to his name, and I look forward to reviewing others.